Home » Griddles, Grills & Fryers » What is the Best Small Electric Grill of 2018? Not everyone has a normal sized kitchen or backyard to take advantage of an outdoor grill or powerful indoor electric grill but that doesn’t mean that you have to forego grilled sandwiches, vegetables and meats! If you get the best small electric grill that will fit in a tiny counter space in your apartment, RV or dorm room, all these are possible. With a small indoor grill, you may have to forego certain features and you won’t be able to make anything for more than one or two people at a time, but there are some models like the ones we’ve reviewed here that work quite impressively. There aren’t too many time tested models in the compact grill category but you can find a few gems online, like the ones below. The Presto 07211 Liddle Griddle is quite appropriately named, as it is quite a little griddle. This griddle has only about an 11 inch by 9 inch cooking surface, but don’t let size belie it’s usefulness, because it cooks big at 100 watts of power. You can fit 4 eggs or 2 steaks on it at a time. Yes, you aren’t going to be able to make up a family sized meal on this griddle, but for one or two people, this unit is the best small electric grill you can buy. Plus, it’s small enough to be considered portable, which means it is perfect for RV camping or the dorm room at college, and it will take up very little counter space as well. The non-stick surface is very tough and flat but textured, just make sure to oil it occasionally and never use anything but plastic or wooden implements. But that bit of advice goes for all non-stick coated surfaces, and this one is no different. It is so compact that it won’t even take up much room in your dishwasher, and yes, it is completely dishwasher safe, as long as the temperature control plug has been removed. This control regulates the heat from warm to 400 degrees F. Cabinet space? No problem, it will even fit on its side in deeper drawers without a hassle. One of the best things about this griddle are the lack of “hot spots.” The temperature is even and precise across the entire surface, so you’ll never have burnt corners on French toast or soggy centers on pancakes. Best of all, even though there is limited cooking space, there is actually a grease channel on the end that catches grease and fats from such foods as bacon, pork patties, burgers or steaks. So, if you are looking for a compact flat griddle that will do your cooking proud, keep fats and grease away from your food and be versatile enough for steaks, chops, eggs or grilled cheese sandwiches, than check out the Presto Liddle Griddle for big time cooking in a compact design. Although they didn’t invent the compact grill, the George Foreman brand took it to a new level, and if you just need something small for a couple of people, the Foreman GR136B 2-serving Classic Plate Grill has got you covered. As the saying goes, this grill allows you to “knock out the fat,” by channeling it into a separate external drip tray that can be cleaned in the dishwasher. The grill is slanted towards the front and the cooking surface is ridged, which is why this unique design and drip tray work so well. It comes with a plastic cleaning spatula that fits handily between the interior ribs, and after that you can damp wipe it clean. The non-stick surface has been greatly improved, and this new version is made to last a lifetime of use, as long as you use plastic or wood for flipping or moving your food. The compact size means you won’t be able to make family sized steaks or chops, but for smaller portions, either for you or a couple, it works great. And because it is smaller, it heats up faster and cooks quicker than its bigger Foreman brothers and sisters. These Foreman grills have been time tested to just about perfection, and they last and last. They started the countertop grilling revolution, and there may be other brands out there, but none are as well known as the George Foreman family of grills, especially for meat. If you like your grills compact, and don’t want to go with a Foreman, then the Proctor-Silex 25218 Compact Grill is a worthy solution. Compact means compact (32 sq. inches of grilling area), and this grill is really only suited for one person, or possibly two if you are using very small cuts of meat or vegetables. It is also one of the lowest priced compacts on the market, which makes it a great bang for the buck unit in that respect. It’s also a terrific little grill for RV camping or a single person in a dorm room, and the small size means it cooks very fast. It features a unique design that channels all fats and grease to the center, where an opening in the front lets it flow into an external drip tray. It comes with one of the best non-stick cooking surfaces on any grill, but always use plastic or wood when flipping or moving meat or veggies around. It is easily damp wiped clean and comes with a plastic spatula to lightly scrape between the cooking ribs. It is very energy efficient and will save you money on your energy bill if you use this appliance instead of your stove or oven. The cord is only 3 feet short so if you are cooking on a table away from an outlet, plan on getting a heavy duty extension cord. Truthfully, for the money and for personal use, you’d be hard pressed to come up with something better, more durable and more practical, unless a George Foreman Grill is lurking around. While the GR136B George Foreman model above serves 2 patties at a time, this Removable Plate GRP1060B model can serve 4 without taking up too much extra counterspace. You gain more in terms of efficiency, not just by doubling the amount you cook in one go, but also because it heats up about 35% faster than older models. The larger 60 square inches cooking surface means you can grill up 4 burger patties together. Not only that, but unlike all the other models, the grill plates are removable via spring release tabs, so they can be soaked in the sink or cleaned in the dishwasher. The non-stick coating is very durable too so it makes it a really good choice for anyone who finds clean up a painful chore. You can also use little to no oil while cooking to keep your foods heart-healthy. Because the plates are removable, you may find that you won’t get a nice sear on meat, especially steaks, although they will cook fast and well. If that is something that’s very important to you, get a fixed plate model or get a larger and more powerful electric grill that comes with a sear function. 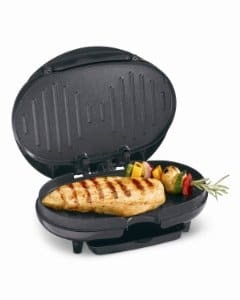 So, although this George Foreman model isn’t as small as the others in this list, we think that it is well worth getting if you can find just that little bit of extra space in your kitchen for it. However, be aware that its electrical cord is only about 25 inches, so you’ll need to have a spot for it right near an electrical outlet.